What Do You Need to Operate a Boat Safely in Florida? Boating safety and responsibility remains a common concern among Florida legal professionals. Florida is a popular spring break and summer vacation destination for families and college students alike, as the Sunshine State is known for its weather, sunshine, and sandy coastline. Before you step behind the wheel of a boat, however, you need to be aware of the laws regarding boat operation. You want to make the most of your vacation and have a good time. You do not want to get wrapped up in a liability lawsuit. 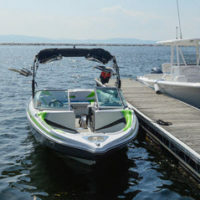 If you are planning on operating a boat at any time, continue reading to discover the most important items you will need. Every watercraft needs to carry at least one type I, II, III, or V personal floatation device (PFD) for each person aboard the vessel. They should be easily accessible in the case of a boating accident. All children under six years of age should wear a type I, II, or III PFD while the vessel is in motion. Any vessel that exceeds 16 feet in length should also have a type IV PFD (throwable device). The owner and operator are both responsible for making sure all PFDs are available and used properly. You do not need a license to operate a watercraft in the state of Florida. However, you do need a Boater Education Card. This is required for anyone born after January 1, 1988. You must carry it with you at all times while operating a watercraft, along with a photo ID. Anyone under 14 years of age cannot operate a watercraft, even if they have a valid Boater Education Card. In order to get a Boater Education Card, you must complete a course approved by the Florida Fish and Wildlife Commission. You can also pass an equivalency test without taking a course. Courses cover proper operation and maintenance protocols, legal requirements, and what to do in the case of an emergency. Once you obtain your Boater Education Card, it is good for the rest of your life. There is no need to renew it, but you will need to replace it if it is lost. Like operating a motor vehicle, you cannot operate a watercraft while intoxicated. Boaters with blood alcohol contents higher than 0.08% will be considered boating under the influence. If you get two violations within a twelve-month period, you will have to attend a certified boater education course. Until you complete the course, you will not be allowed to operate a watercraft. Operating a water vessel comes with its fair share of dangers and risks. Boating is a privilege that should be handled responsibly. Not everyone is as responsible as they should be, and accidents do happen. If you were involved in a boating accident, you may need to make sure you are protected. The Miami boating accident attorneys at Spencer Morgan Law can investigate the circumstances surrounding your accident and determine if one or more parties failed to take proper precautions before hitting the water. If we discover that the liable party failed to adhere to Florida’s boating regulations, you may have a strong case. Contact our legal team today to discuss the strength of your case and possible legal options.